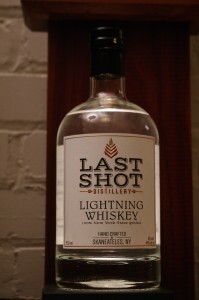 Notes: Last Shot Distillery is one of the newest distilleries in New York State ( producing,selling and aging products not just setting up as many are).Run by Chris Uyehara and a very small team, Chris is a master chef and pastry chef and brings his art and attention to detail to all his products. Made in small (about 100 gallon stills, they concentrate on small batch and quality. 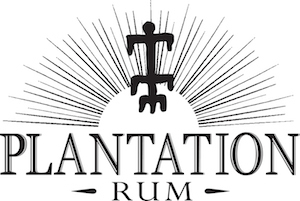 Their current line up includes a nicely flavorful vodka, a 100% corn unaged white whiskey, a white maple distillate, and this their unaged white whiskey that is also being aged and will be bottled as bourbon when it is ready. Appearance: Clear, with a slightly sap like or oily appearance, reflecting the grain germ/oiliness that promises a smooth and full taste.On swirling it leaves a nice somewhat heavy coat on the glass and exhibits great body and texture. First Impression: Full on mellow corn and grain smells with a creamy, buttery nose with a little spiciness and sweetness mixed in with a overall well integrated and lovely bouquet on the nose. Drinks: Great to use instead of a bourbon or to swap out a white rum or cachaca for a delightful mojito/julep. The roundness, mouthfeel and depth of the whiskey makes it a natural for a well balanced drink, that will provide a mellow mouthfeel rather than the usual somewhat thin and cutting body that many white whiskies seem to have. Bottle: Well done and distinctive label – unlike most. Clear glass apothecary type bottle with a black topped ridged stopper which is particularly convenient as it aaffords a good grip for easy opening. Composite cork guaranties a good seal and no loss or leakage.Sealed with a black neckwear that is easy to remove. 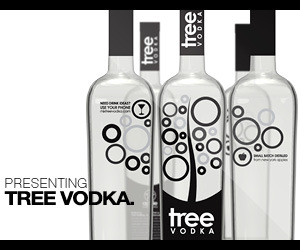 Overall a very attractive and easy to spot package on a store shelf,back bar or home bar. Well done ! Final Thoughts: An outstanding white whiskey, can’t wait to see the bourbon come out ! Price is exceptional for the quality that you get.Most handcrafted whiskies cost a good bit more and the quality is not as good.